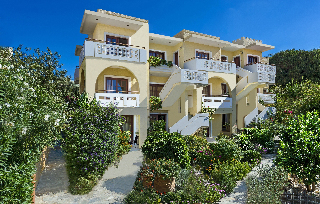 This modern apartment complex enjoys a strategic setting near the centre of Chania. The apartments are located within easy access of a number of attractions in the area, and lie just a short distance away from the seemingly endless shorelines of the pristine, tranquil beach. Guests will find themselves exploring the essence and intrigue of the area at ease from this charming complex. This delightful apartment complex greets guests with a charming architectural style. The guest rooms are spacious and tranquil, featuring soothing tones and splashes of colour. The rooms come complete with modern amenities for added comfort and convenience. Guests will be impressed by the charm of the location, as well as the homely-feel on offer at this apartment complex. NO Small pets allowed (under 5 kg), NO Wheelchair-accessible, YES Car park, NO Garage. Entertainment: Outdoor freshwater pool, Children’s swimming area, Sun loungers, Parasols, TV lounge.